A Masterplan and Delivery Strategy (MDS) for Tresham Garden Village (TGV) was agreed by Full Council on October 15 2018, subject to the resolution of outstanding technical details (and consequent revisions). These are to be agreed under delegated authority to the Executive Director and Monitoring Officer in consultation with the Chairman of TGV Project Board, Chairman of the Planning Policy Committee and the Leader of the Council. Work is ongoing to finalise the MDS as per the recommendations agreed at the Full Council meeting and a planning application for the Garden Village is anticipated later in 2019. These draft proposals can be viewed online via a website produced by the promoters. 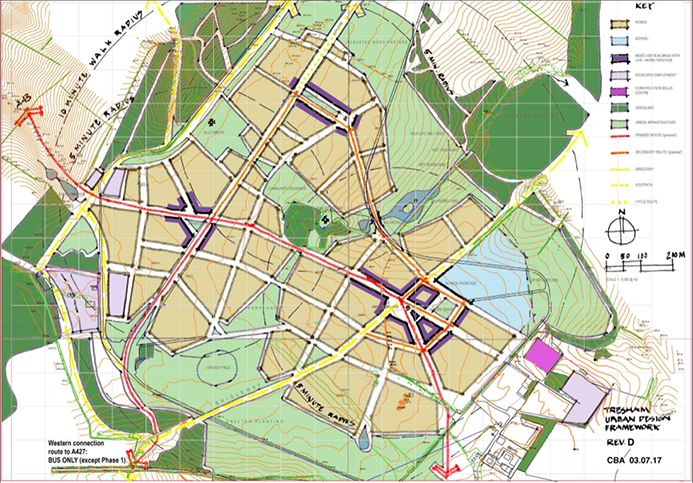 This provides more detail on the consultation process and an online survey through which feedback was gathered to enable refinement of the MDS for Council endorsement and enable the promoters to submit a planning application for the site (which will be determined in line with Local (Joint Core Strategy for North Northamptonshire including Policy 14 – Deenethorpe Airfield Area of Opportunity) and national planning policies). Tresham Garden Village (previously referred to as Deenethorpe Airfield Garden Village) is one of 14 garden village projects that the Government is supporting through capacity funding and assistance from the Homes and Communities Agency. This support is helping East Northamptonshire Council and the North Northamptonshire Joint Planning and Delivery Unit to work with the landowner in preparing a detailed masterplan and delivery strategy. It will pay for extra staff capacity, specialist advice including design and viability, community engagement, and various studies. Location of proposed Garden Village. 360 degree panoramic aerial imagery of the site is also available here. The proposal for an exemplary new Garden Village is being promoted by the Deene Estate, which has owned the land for over 500 years. The new village, including up to 1,500 homes, community facilities, shops, business premises and generous green spaces, would occupy part of the 600 acre airfield site located between the villages of Deenethorpe and Benefield to the east of Corby. The idea of creating a Garden Village at the airfield was tested through the preparation of the North Northamptonshire Joint Core Strategy (the strategic policy framework for the local authority areas of Corby, East Northamptonshire, Kettering and Wellingborough). This was adopted in July 2016 following various stages of consultation, and an examination by an independent Inspector. Policy 14 of the Joint Core Strategy (JCS) identifies the opportunity to create an exemplary Garden Village and sets out demanding standards for its design and operation. The JCS can be viewed online and at libraries and main council offices. The material provided by the Deene Estate at the JCS examination is available online. The Council is working to ensure that the Garden Village proposal is of the highest possible standard of design and sustainability and addresses concerns and opportunities identified by local communities. 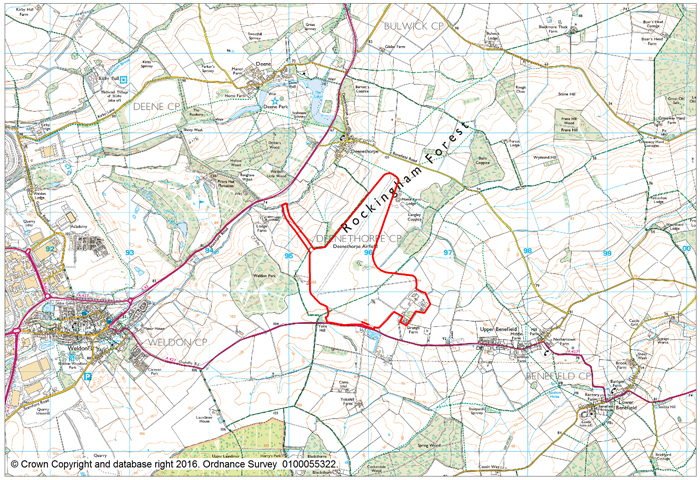 This work is being steered by a Project Board including representatives of the District and County Councils and the Parish Councils of Deene and Deenethorpe and Benefield. The masterplan will be subject to full public consultation and, if it meets the requirements of JCS Policy 14, will provide the basis for a planning application early in 2018. The Deene Estate has requested that the proposal should be known as Tresham to commemorate the historic links between the Brudenell and Tresham families (Sir Thomas Tresham’s daughter Mary married Thomas Brudenell in the early 1600s and spent many years living at Deene Park). Following consultation in March/ April 2017, East Northamptonshire Council has confirmed its support for this name, subject to it being referred to as “Tresham Garden Village” to avoid any confusion with Tresham College. It is important to emphasise that giving a working name to the proposed Garden Village does not prejudge the outcome of the planning application process that is to come. As a first step in producing the masterplan, the approach to the design of the village has been refined through the production of an urban design framework (UDF). The purpose of the UDF is to establish a robust structure for Tresham Garden Village so that the long-lasting elements of the place (landscape, movement and land-uses) can be agreed prior to the development of a more detailed Masterplan. The preparation of the UDF has involved collaborative working between the promoters’ consultancy team and the Council/ JPDU through technical workshops involving a wide range of stakeholders as well as independent design review provided by OPUN (the architecture centre for the East Midlands). The UDF was presented to the Council’s Planning Policy Committee in July 2017 where it was endorsed as a basis for further work. The promoters are working on a masterplan right now which will give a broad overview of what will go where (the location of specific land uses such as housing, employment, schools, green space etc.) as well as basic details on access and movement across the site, links to existing key infrastructure and how the site will connect with the wider area. The timetable is for a draft masterplan to be completed by February 2018. There will then be a programme of consultation and community engagement in March/April to inform and update the general public, stakeholders, local groups and interested parties about the work being carried out on Tresham Garden Village. It’s vital that those with an interest in or who are affected by the proposal have the opportunity to have their say and express their views, to attempt to build consensus for a way forward. Details of consultations will be publicised in the local press and on this website. Providing local shops/services and a range of spaces for community use. The masterplan will be prepared in consultation with the local community and stakeholders and agreed by the local planning authority (East Northamptonshire Council). Feedback will be considered carefully by the Council and the promoters of the Garden Village. Where appropriate, the proposals will be amended to address issues raised. The aim is to report a revised masterplan to the Council in summer 2018. What happens after the masterplan is approved? The Masterplan will help to guide and inform the preparation and submission of a future planning application. Subject to consultation feedback on the masterplan, the current thinking is that this could be submitted in summer 2018. The subsequent determination process will take a number of months and it is unlikely that the application would be determined until autumn 2018 at the earliest. We will keep this page updated with the latest information but to receive information direct, you can register an interest by email or phone 01832 742358. To register an interest in self or custom build opportunities, please go to our self-build page.